The student page contains the hook only. It is intended to spark interest in the topic and lead students to ask questions or make predictions. Have you ever wondered what it would be like to be a soldier in The Civil War? What would it be like to be in a Civil War battlefield? How could we learn more about the life of a Civil War soldier? Click on the link below to view a PowerPoint presentation. Pay close attention to the battlefield paintings. Imagine being inside the paintings. What kinds of obstacles did a Civil War soldier have to overcome? How does this style of fighting compare to the ways wars are fought today? Did any one image stand out? Any one person? The goal of this activity is to get students to form an argument that they can defend with primary resources. The following are questions that students might want to consider. These questions are not yes or no questions, but rather require the to investigate, to play detective, to play historian! What was life like for a young soldier fighting in the Civil War? Why did the North enter in the Civil War? What were some of the weapons that soldiers used? Did they have guns during the Civil War? How reliable were they? What was the role of horses in The Civil War? Were they hurt often? It is important to be cognizant that The Civil War took place over a hundred years ago; thus, there are many terms and names that students are going to be unfamiliar with. It is important that students take the time to look-up any unfamiliar words in a dictionary or some other available resource. For the examples shown on this web page a concept map is used. Since the website Valley of Shadow is very comprehensive in terms of how well it covers the Civil War, it will not be necessary for students to use other sites; however, they may if they choose. Students, exploring Valley of the Shadow, will discover a section called Letters and Diaries. Using this, students will find a variety of primary resources, which they can use to construct the experiences of Civil War soldiers. Below is an actual letter. Here is another example of an actual letter from a Civil War soldier. Of course, students will not be able to read this script, as it is often illegible. The website provides transcribed versions of its entire collection. Below is a transcribed version of a letter from Jacob D. Miller, a Confederate soldier. "I went down in a sailboat and it rained all the time we were gone three days we only shot 4 geese and 3 brants and 9 ducks when i was down i trapped 9 muskrats and a groundhog when i was washing my gun in camp, there was a deer came swimming and stopped right in front of me, it then heard or saw me and swam over to the other side." This letter talks about the hunting experience of a Civil War soldier. From this letter alone, one cannot construct an argument for what he or she believes life was like for a Civil War soldier; however, from many primary sources, such as this one, one can create a good argument for what life was like for a Civil War Soldier. Moreover, it is important for students to understand this and review as many primary sources as possible. 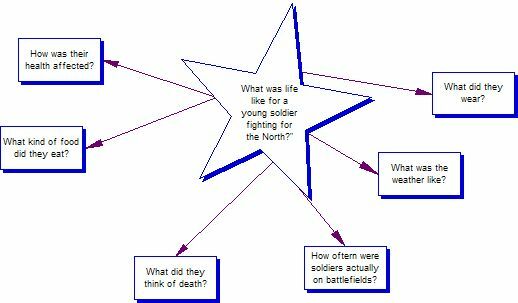 In any case, students, then, should transfer their primary source data to their concept map, not worrying about organization, yet. At this stage, the students should have a concept map such as the one below. Since the graphic of the concept map is hard to read, click on it to open the full concept map. 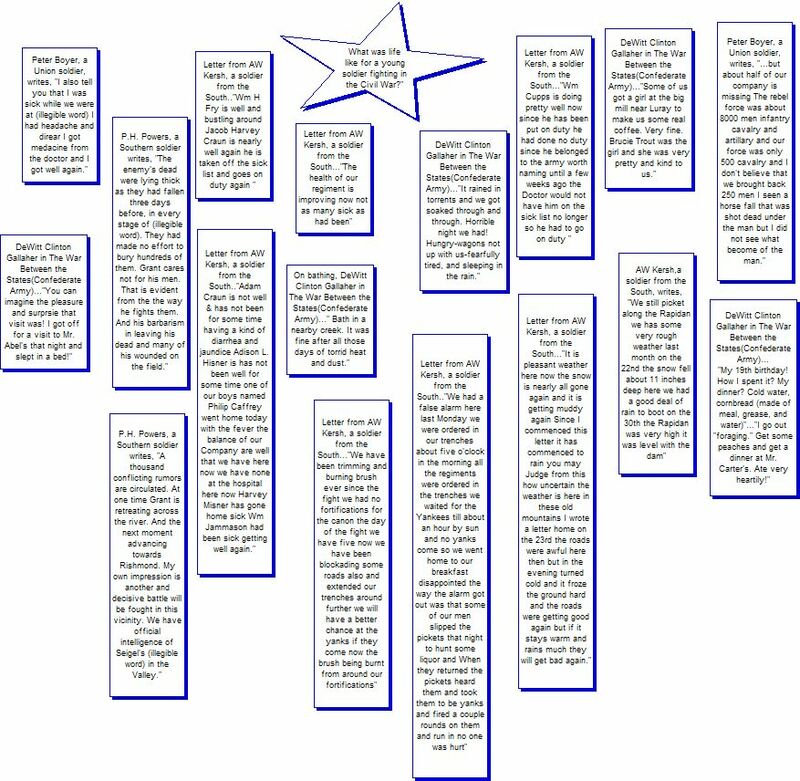 The next step is for students, using the above concept map, to organize their primary sources, using categories and sub-categories as necessary. For example, if they have five primary sources dealing with Civil War soldiers' health, then it would make sense to create a category for "health." Likewise, if there are primary sources that deal with Civil War soldiers' battle field experiences, then students should group these primary sources under "battle field experiences." 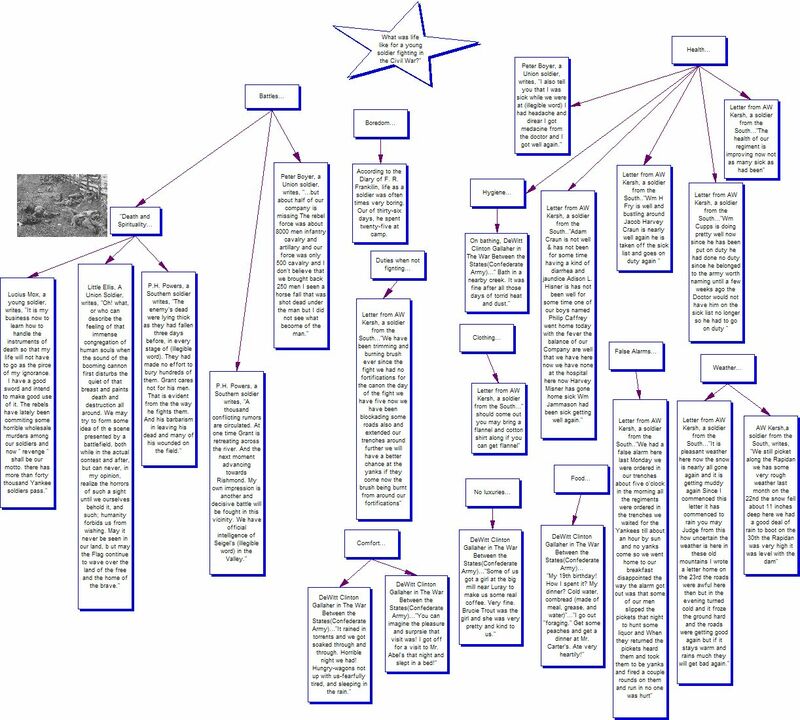 Below is an example of a the concept map in its third stage, with primary sources organized into categories. Again, since the graphic of the concept map is hard to read, click on it to open the full concept map. After students research primary sources and organize their primary sources on a concept map, they should present their findings. There are many different ways students can present their findings. To foster student autonomy, it is a good idea to let the students decide how best to present their findings. Deciding how to present one's findings is an important adult-world skill. There are many different ways students might decide to present their findings. Some, for example, might decide to do a formal presentation in front of the class using visual aids and perhaps a digital projector. Other students might decide to present their findings in the form of a persuasive essay. Below is an example of how a student's essay describing what life is like as a Civil War soldier might look like. Whether fighting for the North or South, a young soldier’s life was characterized by extremes. There were times of extreme boredom; soldiers such as F.R. Franklin spent months at “camp,” awaiting the next battle. Then, often without warning, soldiers would engage in fierce, brutal battles with the enemy. Battles were often gory; death surrounded soldiers. 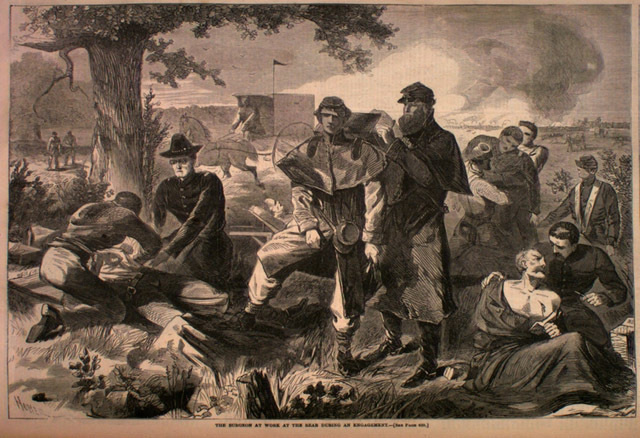 Peter Boyer, a Union soldier, described entering a battle with five hundred men and returning with only two hundred fifty. Some soldiers became obsessed with death and revenge, such was the case of Lucius Mox, a young Confederate soldier. He writes that “revenge” is his motto and that he has a “good sword” that he intends to use. Other soldiers write of the “barbarianism” of leaving dead and wounded soldiers on the field. Clearly, life as a young soldier was, indeed, barbaric. Young soldiers lived in uncomfortable conditions; they slept in rain, walked through mud, often went without food, rarely bathed, and survived freezing temperatures. In letters, soldiers describe sleeping on “frozen ground” and walking miles in “eleven inches of snow.” Soldiers write of meals consisting only of “old water, cornbread (made of meal), grease, and water.” From these dire conditions, soldiers often experienced poor health. AW Kersh, a Southern soldier, writes of always “having diarrhea and fever.” In fact, as one soldier asserts, sickness is as much as a cause of death as the battlefields. Unfortunately, these cruel conditions, where death and illnesses were everyday occurrences, were often the last experiences of thousands of young Civil War soldiers. In terms of whether or not there are clear-cut answers to the questions asked, there are not. This is an important concept for students to understand. One of the purposes of using primary sources is to allow students to play historian. Historians interpret data. Their interpretations of this data are just that, interpretations. Thus, answers are not clear-cut; they are speculative. Of course, there are clear-cut historical answers, such as who won the Civil War; however, the inquiry-type questions that one wants students to ask should not have clear-cut answers; if they do, then something is wrong. The goal is for students to construct an argument from primary sources. Why did the North win the Civil War? How were children of the Civil War affected? What was life like for crippled Civil War veterans after the war?